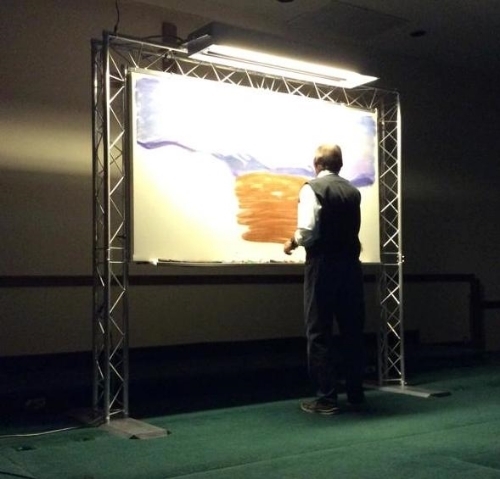 Bill Cox's ART TO HEART presentations have been featured with great response for over 40 years at regional, state, and national conferences as well as at hundreds of churches throughout the country and beyond. This unique and powerful worship experience appeals to all ages and has consistently received enthusiastic response from children through senior adults. The complete program includes a 25-minute special effects chalk drawing plus drama, message, and music. The drawings are done on a large drawing board with colored and fluorescent chalks. Several types of black lighting and special effects enhance the drawings and seemingly bring them to life. They are unlike any other chalk drawing you may have seen. Each drawing is done to a soundtrack of music, narration, and sound effects. Services usually range in length from 60-90 minutes, or in some situations the chalk drawing can stand alone. CLASSIC PRODUCTION: We bring a truss system for chalk drawing board, equipment for projected effects, a compact LED lighting system, and an excellent quality sound system capable of easily covering crowds of up to around 750 people. (There are several options for larger crowds with this package.) The classic production is an excellent presentation appropriate for small to mid-size settings and tighter budgets. Since introducing this set up, it has become by far our most popular option. GRAND PRODUCTION: Includes a larger truss chalk drawing setup, larger sound system, and larger lighting system including intelligent/moving lights. With this set up, we also bring a technical engineer. When you want an outstanding large-scale special presentation with bigger sound and lighting, the grand production is available on a more limited basis.